Subscribe FREE and get our e-BOOK with Bath and Body Formulas! Making Your Own Herb Garden Door Wreath Making Clay Seed Balls Seed & Plant Swap: Save $100's! If you can grow vegetables in the garden or flowers, then you can learn how to grow your own herbs. Herbs not only give off a nice scent, but they can also be used in cooking. Growing your own herbs is a cheaper alternative than buying them at the grocery store too. If nothing else, this is a great easy gift for you to put together and give anyone who likes to cook! First, you must decide on what kinds of herbs you would like to grow in your herb garden. There are many different kinds to choose from, such as Cilantro, Basil, Oregano, Parsley, Chives, Rosemary, Dill, Bay Leaf, Garlic, Caraway, Celery, Chili Pepper, Ginger, Horseradish, Red Pepper, Paprika, and Sage, just to name a few. All of these herbs can be used in cooking. And, if you have a cat, you might want to please him or her by planting one of their favorite herbs, which is Catnip! 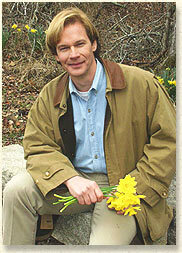 P. Allen Smith (below) is such a green genius. He recommends using a lazy Susan to make the job of potting your small pots or large container garden easier. Basically you just put the small pots or large container on the turn table and spin as you work. This is similar to how a floral or pottery designers create their art! His recent book 60 Recipes to Accent Your Garden is worth buying. Plant's That Grow Enough to Share: Basil, Peppers, Tomatoes, Zucchini, Coleus, Hydrangeas, and Old Roses. For the best quality seeds go to Gurney's below. Watering time holding you back? Try the water retention beads. If you use more than 1/3, the beads will float up through the dirt and that does not look very good. You have seen him on TV, and the Mabel staff has seen no other entity make soil or "life" as interesting as P. Allen Smith. I caught a quick segment where he recommended storing fresh cut herbs in ice cube trays for future use in soups and the like. His delivery was also very relaxed and comforting. Who would have thought of storing your herbs in ice cube trays other than P. Allen Smith? After looking through his web site, I found that was not the only idea he spawned, it was just the tip of the iceberg (lettuce) of course. Designing Your Herb Garden is Easier Than You Think! Another thing that you will have to keep in mind is that herbs are just like any other plants in that some herbs are annuals, while others are perennials. Annuals will only grow for one year, and then they will die. Perennials, on the other hand, will come back the next year on their own and they will grow again and again. They do not need to be replanted like the annual plants do. Water: When planning any garden, more so in these days of very dry weather, make sure moisture rocks (that absorb lots of water) are well implemented at the bottom of well drained beds. Good drainage typically inhibits some plant disease. Next, plan out your herb garden by using a pencil and paper. Decide how many plants you want to grow and how much room you will need for your total garden. Decide what kinds of plants will be planted where in your garden. You will need to find a spot in your backyard that will receive plenty of sunlight every day. Approximately six hours of sunlight is plenty for most herbs. Be careful, though, as some types of herbs like to grow best in a shady spot. Then, visit your local nursery or garden store and purchase your plants. Make sure the plants you select look healthy and green. Check the soil to make sure it is moist too. Bugs: "Good garden planning starts with good natural insect and disease prevention strategies. We find the higher the garden off the ground, the less pest issues. Marigolds, Basil, Nasturtiums, and Chives are also used generously for our borders as well as crushed shell or sand as a finishing touch. Some insects do not like going over sand or crushed shell." The next step in your project is to till up your herb garden spot. Using a rototiller is your best bet, but if you don't have one, or if your garden is going to be very small, too small for a rototiller to fit into, then you will have to use a spade. And, if you made a compost pile last year, it should be ready to use. Compost would be a beneficial addition to each plant. Then, dig a hole for each plant to be placed in, and do not make the holes too close together. Each plant needs its own space to grow in, and plenty of it! Make sure the plant's roots have plenty of space to grow in too. Add some compost or fertilizer to the bottom of each hole before you place the plant in it. This will help the young plants by adding much-needed nutrients to the soil. Then, gently replace the soil around each plant and pat it down gently. The leaves of the herb plants will be ready for harvesting when the plants have matured. Then, the leaves are removed, washed, and hung up to dry. They are then ready to be crushed and used in your favorite recipes. Post Bugs: We tend to love to put edible oil in spray bottles with perhaps some neem oil for natural insect deterrent. If birds are an issue, just criss cross fishing line above your garden. They will not like getting in that. When you make a banana smoothie for your own health, make one for your roses using the banana skins or whole over ripe banana's! Roses are big feeders and quickly use up all the nutrients in the soil and they just love potassium. This is true for even the best-prepared rose beds. Furthermore, many essential minerals quickly leach out due to rain and watering. Light soils are especially needy of constant nutrient replacements. This recipe is for one rose bush. For a rose cocktail you can also soak the banana skins in water for two weeks and spray the water directly onto the roses. The Queens of the garden like to be treated as royalty and this means continual fertilization and a bit of TLC. This way they will flourish and bring brilliant blooms for an extended season. To control Black Spot spray roses once a month with water, a little cooking oil and a little baking soda. Epsom Salts are simply superb for everything in your yard-trees, shrubs, flowers, and especially your lawn. Epsom Salts contain 16% magnesium and 22% sulfur to deepen the color, promote new growth, and even help strengthen stems and roots. Many store bought fertilizers are available, but making your own may bring better rose results: bigger blooms and in general, a more healthy plant. Please note Jerry Baker's Flower Feeder: 1 cup beer, 2tbsp whiskey, 1 tbsp. clear corn syrup, 2 tbsp. fish fertilizer, 2 tbsp. ammonia, 2 tbsp. liquid dish soap, 2 tbsp. hydrogen peroxide, 1 tbsp. unflavored gelatin, 4 tbsp. instant tea granules. Mix it all up with 2 gallons of warm water. He recommends feeding this to all your flowering plants every two weeks. Use Your Seasonal Door Wreath Colors to Select the Colors of Your Garden! Using flowers straight from your own garden is always a wonderful luxury. For each of the four seasons I generally select a wreath for my door to honor that season and then I update my garden to match the colors that are in the wreath and I try to use the same flowers that are in the wreath. This gives the appearance you had a designer involved! You can also do this vise versa. Meaning select your greeting wreath based on your outdoor plants. 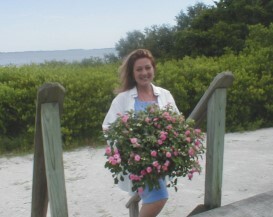 I always select flowers that are known to bloom as long as possible and hold up well after being cut. Snap dragons are my all time favorite and they come in almost any color. They seem to last forever when fresh as do carnations. Your Choice of vase is really to most important feature in how your arrangement can fan out. Vases with a straight up mouth do not allow for much movement. Another neat feature is if your garden does match your wreath then any flowers you cut and bring in the house match everything outside! We always wonder what petals are really edible to decorate on brie cheeses, incorporate into salads, crystallize with sugar, decorate cakes and many other great uses. Petals that are the most well know include: Batchelor's Buttons, Borage, Calendulas, Dianthus, Geraniums, Lavender, Impatience, Johnny-Jump Ups, Nasturtiums, Chrysanthemums, Stock, and the always popular Pansies. PH balance in soil is vital if you expect to have a healthy and green lawn from season to season. Though soil PH is generally stable, it will tend to move in one direction over time. This direction is almost always negative, which is an indication of a high acid condition, and when the movement exceeds certain guidelines, the consequence will be grass and plants that won't grow right or be able to maintain themselves. They will appear stunted, easily succumb to fungus and other disease and in extreme cases, just die. The most common way to adjust PH is with the use of Lime. Most commonly found as either or a gray or white type powder, lime measures high on the PH scale and will cancel out with the current high acidic condition of the soil. This process will "adjust" the current PH level and hopefully bring it more to a balanced value. There are some guidelines to follow as to how much lime should be applied based on how much of an adjustment is needed. I did not know places like Starbucks gave away used coffee grinds for soil enrichment. Not only is that a trump of a marketing tool, it is an honest one. From what I understand, Tim Horton's Coffee Shops (Starbucks to the Canadians,) does also. First let's address the coffee grinds! I could not remember what purpose they serve in the garden. I thought it was the fact slugs do not like to venture over them. Some quick research on The Garden Web revealed USED grinds fertilizes anything green, including grass, by supplying organic matter high in nitrogen and is quick to decompose since it's already in tiny pieces (and usually wet.) Acid-loving plants, such as Gardenias, really like coffee grinds. Worms are very needed in a garden and they go nuts over coffee grinds. Garden Web groupies also report loving the smell! I like the Garden Web, and I even got a free nice high quality t-shirt for donating. I ordered X-Large so I can sleep in it also. Back to coffee grinds, how much do you spread out? Well, as one Garden Web member said "just don't cover the grass, otherwise, anything goes." Well, then what about tea remnants? I have been drinking a lot of that, AKA Chai. But I start with real Darjeeling Tea from the Himalayas. Well, this gets technical because compost aficionados call certain combinations "teas" or "soil amendments." I will skip that part, sounds too legalistic. But it was interesting that even old cat and dog food is great for your yard! And I just pitched a 50 pound bag in the garbage because it was too old. Duh. But it maybe best I did, as I assume old food it would invite rodents. I will pass on fish emulsion, thanks, and everyone knows cow manure is the best, and free source of nitrogen--if you know a cow. Speaking of cows, some new commercial features a cow named Mabel, and I really do not appreciate that. I will be a heifer as it stands when we add chocolate in the fall. And finally, if you are in a hurry, human urine is an excellent source of organic nitrogen. I swear I will never kill another slug with salt. I am not sure where I read it was "the" thing to do, but it is a very slow and painful death for a slug. Once was enough for me, and I noticed it was not a fair fight either. The best way to handle slugs is to just deter them. They do not like to climb around sand, sand paper, or anything very gritty, so that works for me around my pet plants. To keep birds from eating your berries, simply criss-cross string above your garden. It can be clear if you like--such as fishing line. Birds are not interested in getting all hung up in string and this technique works very well to protect fruits. Another important note about landscaping is to arrange the flowers in anything but rows. Pests find rows easy to navigate. Nature never grows in rows if you think about it. Another important tip is that even when using commercial pesticides, the threats can become desensitized and adapt around them. Most pests do not like Nasturtiums or Marigolds, so I do many borders with them. Now, mites, the bugs you really cannot see with the eye, are just so persistent in the South. I have to lower myself to the use of SEVEN, once a month. That also solves the Japanese Caterpillar problem. When I find that a simple oil soap combination will work just fine, I will eliminate the SEVEN. Anyone wit ha sure technique, please let me know! Here is a good link to the Garden Web full of ideas on natural pesticides. Note line 12 and 13 support Leane's theory and line 17 mine. Click here for the Garden Web. I like relaxed social events, and how nice that some are inspired over the net. I like to dry and save rare seeds, as well as exchange them. Below are some clubs that exchange rare seeds at the price of postage. You can also save $100's of Dollars exchanging plants. Seed balls are marble-size spheres made of dry powdered red clay, soil, humus, seeds, and water, pioneered by the Japanese natural farmer Masanobu Fukuoka. They have been called "little adobe gardens." This activity creates a complete embryonic world and can be used on small or large scales, wherever revegetation is needed. Perhaps seeds are so small they do not create a lot of interest. Making clay balls with seeds not only makes gardening more interesting, but may allow the seeds to be better organized. You write on your clay balls and number them as a method of identification when dry. This can be important when you are trying to organize by type, height, color, sun or water tolerance, season, or for any other reason. This is also a neat way to date them. This recipe assumes normal rainfall. In absence of normal rainfall or water retention measures, they will need you to water them. These can be cast anywhere revegetation needs to take place. Roll well into 1/2 ounce balls, no bigger than the diameter of a quarter. Store in cool well ventilated place or use immediately. Plant 1 seed ball per square foot or 10 seed balls per square meter.